In the conference “The future of the European Union and the role of regions” that happened on the 10th of April 2018, several themes have been discussed, as the risks of a multiple-speed Europe, the legitimacy of the principle of subsidiarity, the heart of European architecture or the future of the social Europe and of the Cohesion Policy. 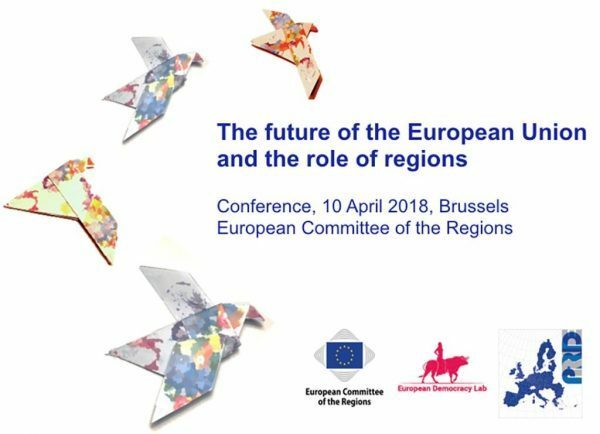 Regions seem to be closer to the citizens and they are seen as important actors to rebuild trust in the EU. They are the links that bring Europe closer together, and it is essential that the EU gives high priority in the future to supporting and reinforcing regional co-operation activities, particularly given the instability facing Europe. The opinion, coming out of the conference, is planned for adoption in the CoR plenary on 8-10 October 2018. Consider that cohesion should be the number one policy priority for the EU and that having cohesion available in all regions is of great important for EU future. For more information, please check, the agenda here and the online streaming of each workshop here. © 2019 Startup Europe Regions Network.